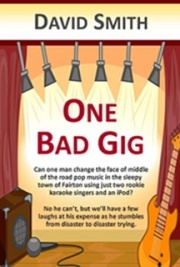 Can one man change the face of the road pop music in the sleepy town of Fairton using just two rookie karaoke singers and an iPod? No he can’t, but we’ll have a few laughs at his expense as he stumbles from disaster to disaster trying. Pete Belcher is an incident prone hapless semi-pro musician on the bottom rung of the gigging circuit. After his disastrous performance at a wedding he winds up sacked. He starts his own band using karaoke backing tracks instead of musicians hoping it will finally lead him to his rightful pot of gold. He advertises for a lead singer and auditions the sweet Carol and the sour Simon, and hires them both. This begins a hilarious series of incidents and disasters that ultimately end with Pete in a heap of trouble but emerging as Fairton's hero.